Emirates airlines had announced that it would suspend flights EK348 and EK349, which currently operate between Singapore (SIN) and Colombo (CMB) from the end of October this year, a Spokesperson for Emirates said today. They said the decision was made after a periodic review of the Emirates operations to ensure the best utilisation of its aircraft fleet. Accordingly, the final day of service from Colombo to Singapore will be on 27 October 2018, while the final flight from Singapore to Colombo will depart on 28 October 2018. “Passengers with flights originating from Dubai or Singapore with a layover in Colombo will be rebooked on to alternative flights and notified accordingly. Customers booked only on the affected flights between Singapore and Colombo should contact the travel company where their original booking was made for assistance,” the Spokesperson said. They said Sri Lanka is an important business and leisure destination for Emirates and that it continues to serve the Sri Lankan market directly from Dubai. “Emirates apologises for any inconvenience caused by the suspension of this route,” they said. 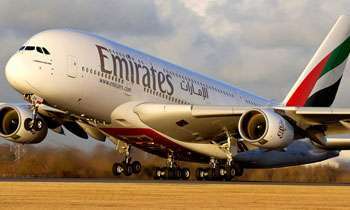 Meanwhile, it was speculated that SriLankan Airlines Melbourne flights have taken away a chunk of Emirates’ traffic. This was a good decision by the former board and the unions criticized these decisions. Another blow to this poor lawless country for its poor minded planners . How come it is a blow ? Those passenger are being catered Sri Lankan now. Emirates stereotypes all Sri Lankans as if we are all housemaids and toilet cleaners. We should have kicked these Emirati buggers to the curb long before MahindaR did. These Emirati's rats think they can punish countries and get away. We should invite competitor's of Emirates like Qatar Airways and other Asian airlines to under cut them. These morons even got landing rights to top airports through Sri Lankan. emirates shouldnt stop its service to singapore from colombo.. SLA provides a crappy service!! UL is playing spoilsport. They don't make money and don't let others make money. Sri Lankans should stop paying taxes if the govt keeps covering the billions of losses UL is making. No logic in your statement. CMB-MEL is very profitable for UL. You see! They are not stupid to run flits at a loss unlike Srilankan. Sad.. This was the most economical ticket.. usually between 2 and 5K cheaper than UL (which was the next best price)..
Airlines cutting flights and pulling out is a sign our economy is going down. Yes, the most economical ticket from Singapore to Colombo in a big Boeing 777. UL service from SIN and BKK is very poor, in very old aircrafts. This EK service was the only reliable and economical option vis SIN. Hope EK will reconsider this suspension.